To make a reservation with CART, please call during regular business hours Monday-Friday, 8:30 a.m. to 4:30 p.m. 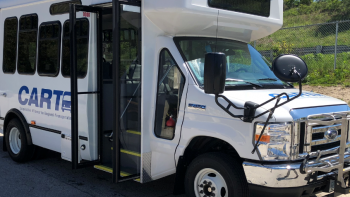 When calling, please let our Call Center Representative know with which service you would like to schedule a ride with curb-to-curb service or a Shuttle route deviation service. To Schedule Curb-to-Curb Rides: Since this is a shared-ride service, rides must be scheduled several days in advance (but no more than 14 days in advance). If your preferred time is unavailable, we will make every effort to work with you to create a suitable alternative. Short notice reservations will be accommodated when possible. specific travel request, and any special mobility needs. you to board the vehicle. To cancel a reservation, please call during regular business time at least 24 hours in advance of your scheduled time. To cancel a Monday ride, please call the preceding Friday or leave a message with our voicemail over the weekend. Catholic Medical Center, Elliot Hospital, The Elliot at River’s Edge and Elliot Outpatient Services, Dartmouth-Hitchcock Manchester, VA Hospital Manchester, NH and limited service to Plaistow, NH. 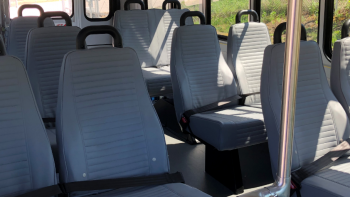 If you live within a quarter mile of the scheduled route, you can arrange to have the Shuttle pick you up in advance by calling no more than 24 hours in advance and by 5 p.m. the day prior to travel. To assist our Call Center Representative in scheduling a mutually acceptable time for your travel, please indicate if you are requesting a one-way or round-trip ride. Round-trip route deviations are allowed for pick-ups at residences only to drop-off locations indicated on the schedule and the return trip must be from original drop-off point to original pick-up location. Passengers are asked to be ready 10 minutes prior to scheduled pickup time as the bus cannot wait. Deviations without prior notice will not be honored. 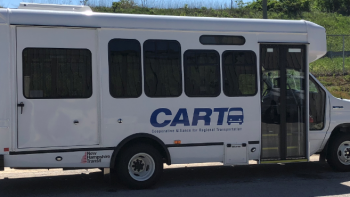 CART curb-to-curb service operates Monday through Friday from 8:30 a.m. to 4:30 p.m.
CART Shuttle services operate from 9:15 a.m. to 4:00 p.m. Service is not available weekends or holidays.